Hello! I am the Chief Polish Officer (CPO) of Pretty Please. Pretty Please nail polish is made especially for you. You select a shade you love and give it your own unique name. This nail polish is all about your vision of what a nail polish should be. You can name your polish for a bridal shower, bachelorette party, birthday party, fund raiser, company event, and the list goes on. When I was asked to be a guest blogger for Mani Monday, I was excited to put my nail design skills to the test. I am constantly posting about nail art on the Pretty Please Facebook page and I figured it was about time I put my money where my mouth is. Using 3 different Pretty Please nail polish colors, and a burst of silver nail art paint, I created a 4 step design called, “Rise and Shine”! For more information on Pretty Please, you can find us on Facebook, Twitter, Instagram (@prettypleasegal) or feel free to email me at sara@prettypleasenailpolish.com. I would love to hear your feedback! STEP 1. 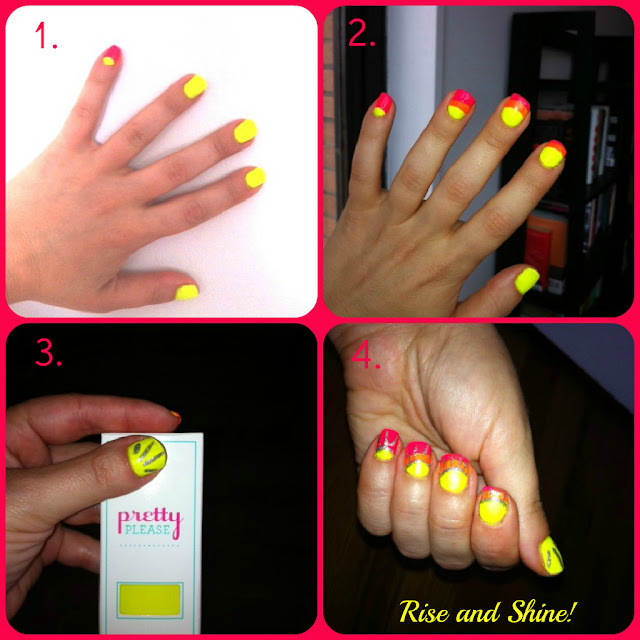 Paint all your nails in Pretty Please #6 (neon yellow). Wait one minute and on your pinky finger only, use Pretty Please #7 (HOT pink) and paint a half moon. If you have a shaky hand, you can use a reinforcement label for a smooth arch. Your sun is now beginning to rise! STEP 2. Using Pretty Please #8 (bright orange), paint your next 3 fingers with a half moon, raising the height of the arch with each finger (like a sun rise). Let your nails dry for a minute and repeat using Pretty Please #7 (HOT pink) above the orange, again, using less polish as the "sun" rises. This isn't an exact science so the spacing is up to you! STEP 3. Your thumb nail should be all yellow. Using Kiss Nail Art Paint in silver, outline the arch of the yellow, creating definition around the "sun". Then, add sun beams! If you want more color, use the pink and orange for beams too. STEP 4. Time to Rise and Shine!!!! .....also known as Glitter and Gloss, Mani Mondays and Just Lovely Things - and how would you like your own set of these fabulous colors???? ...and now you beauties get to link up - five bonus points towards winning the Mani Monday collection if you do! Heather and I can't wait to see what pretties you've come up with! After you link, don't forget to check out some of the other fabulous links, and please show the love and grab a button! Happy Mani Monday and make sure to come back next week for another fun guest blogger! Love those nail colors!! Thanks for hosting! I would make a glitter polish and call it "Fancy Pants"
I would probably have a bold cherry red and call it "Red Lips, Curvy Hips." haha. Love how the mani turned out! So bright and happy. I would make the perfect blue/green with glitter and name it Tahoe blue. Love all the colors, I love the name of the nail poish, lets see I would name my nail polish, Fancy Mama! Love these colors!!!! Hey- who won the giveaway for the bag a few days ago?? It would be a light pink with holographic glitter and I would call it Princess Dream!